Could Mike Trout really win the MVP? 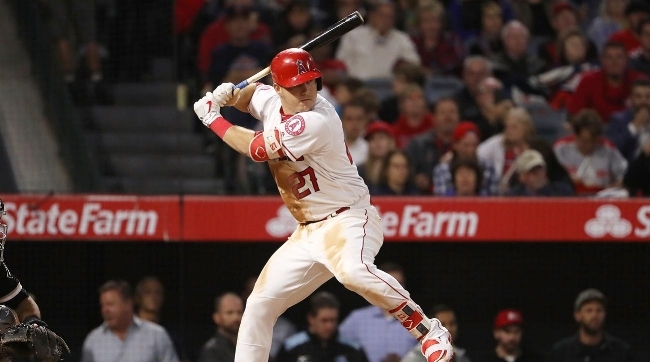 Is anyone surprised that Mike Trout is back in the MVP discussion? After missing 40 games with a thumb injury in June and July, it seemed like a longshot to think Trout would repeat his first half success to catch Aaron Judge or Jose Altuve. Well, he has done exactly that. A couple other factors have aided Trout's MVP candidacy. First, the Angels find themselves in the middle of the playoff race. They are 65-63, just one loss back of the Twins for the second Wild Card. Second, Aaron Judge has been terrible in the second half (.188/.347/.368). So, it's pretty much down to Trout and Jose Altuve, who was taken out of Thursday's game with neck soreness. Trout's 5.7 WAR through 83 games means he's on pace for 8.0 over 113 games (assuming Trout plays 33 of last 34 games). Altuve sits at 7.0 WAR currently; it's pretty easy to envision a scenario where the Astros take it easy on him down the stretch with such a huge lead in the West. If I was a betting man, I'd still take Altuve to win the AL WAR title, but it's not easy. And even if Altuve has a higher WAR—say 7.8 to Trout's 7.5—isn't Trout still the better player? He would have accomplished his feat in 40 fewer games. My guess is that Altuve will win the MVP, but Trout could make things very interesting. If Trout does pull off the MVP, where will that rank him for games played among MVP winners all-time? If Trout somehow wins the 2017 AL MVP, he will be the record holder for fewest games played. When looking at the list above, keep in mind that teams played 154-game schedules until the early 1960s. It should be a fun last five weeks of the season. If we know anything about Trout, it's that you shouldn't count him out.